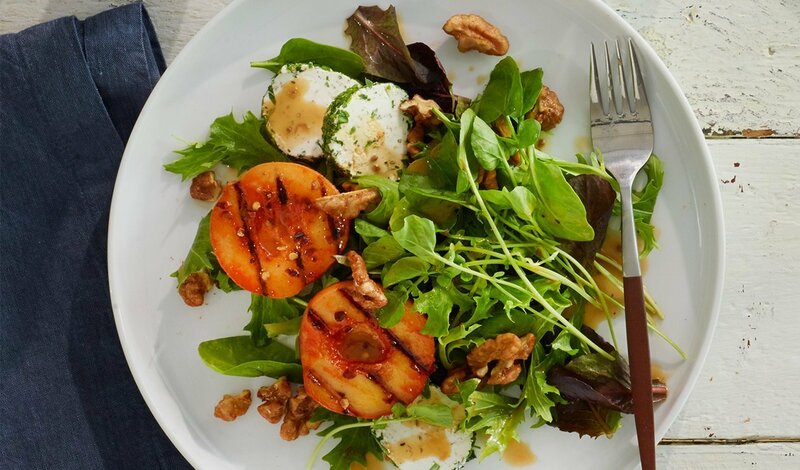 A perfect summer salad topped with juicy grilled peaches, herbed goat cheese, and walnuts spiced with brown sugar and cayenne. Melt butter in sauté pan, then add remaining ingredients. On medium heat, cook until sugar is dissolved and the walnuts are evenly coated. Cool on a parchment lined tray. Combine peaches, sriracha, and crushed red pepper and let marinate for 30 minutes, then cut in half and grill. Combine Hellmann’s® Balsamic Vinaigrette, mixed salad greens, watercress, and toss until well mixed. Top with remaining ingredients.